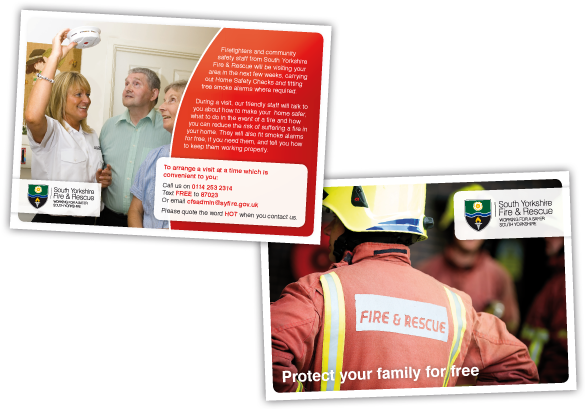 An A5 Home Safety Checks leaflet for South Yorkshire Fire & Rescue to be distributed throughout Sheffield during home visits. This week our Weekly Deal is on our popular Promotacards. These Credit Card size folded cards are a great networking tool, and allow you to encapsulate your business in an easy to digest and portable format. If you have not produced a Promotacard for your business you may be missing out on a real opportunity to get your message out there. And this week is a great time to seize the initiative, because for just one week we are offering a huge 20% additional discount off this unique and already cost effective product. I hope you will be able to benefit from this great offer, valid until Friday 27th April. For more information or to place your order contact us on 0114 229 5325 or email sarah@newstartdesign.co.uk. 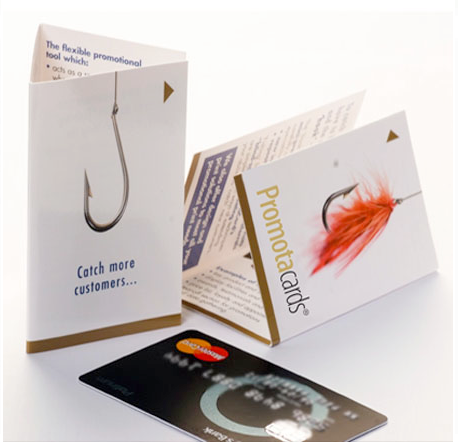 Promotacards can certainly be a great selling tool. Available in Double and Triple Business Card size they are intended to encapsulate your business in a compact way and point potential customers to your website or to phone you. The fact that they fold to business card size makes them the perfect networking tool. Our most prolific market is for hotels, where they are recognised as being THE product to give to happy parting guests with an offer attached for their friends or relatives to stay again. This week we are offering 20% off these fantastic Silent Salesmen, so if you have never tried them before (or even if you have) there is a real incentive to give them a go over the next seven days. Offer valid until Friday 9th March. Call us on 0114 229 5325 or email sarah@newstartdesign.co.uk to place you order. With our new Nine Lives recycled range you can go green and still keep to your budget. And during March and April looking after the planet is even more favourable to your wallet with an additional 15% off our complete recycled range. Please note: Our offer is available on all Full Colour products and quantities from our Nine Lives recycled range and cannot be used in conjunction with any other offer. Please note: Our offer applies to print cost only. It is limited to quantities up to 2,500 and cannot be used in conjunction with any other offer. Design your own Smart Car and save 25%! Experience shows that a high proportion of Model Smart Cars sent out get made, especially if the design is imaginative. And of course each one which is retained works as a silent salesman on the desks of your clients. Why not prove the effectiveness for yourself for less during March and April with our exceptional 25% discount. There has never been a better time to experience the power of promotion. Smart Cars are supplied flat ready for assembly by the recipient. They are designed to fold into a DL envelope. Please note: Our offer is limited to quantities up to 2,500 and cannot be used in conjunction with any other offer. For more information or to place an order call us on 0114 229 5325 or email Sarah at sarah@newstartdesign.co.uk. 15% off Recycled Products – Offer Extended! We are delighted to offer 15% off all our Recycled products this week. From Letterheads to Booklets our Environmentally friendly range is extensive and the materials we use have been produced with a real eye to reducing our demands on the earth. This offer has been extended so now ends Friday 27th January 2012. 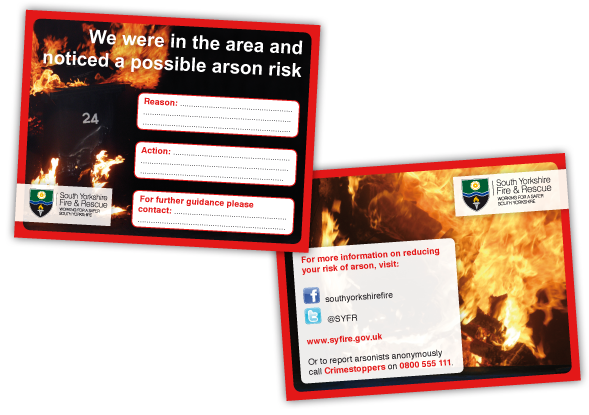 A small 11mm x 85mm Arson Risk Calling Card to be used by fire safety officers and posted through letter boxes to notify residents about potential arson risks affecting their property. 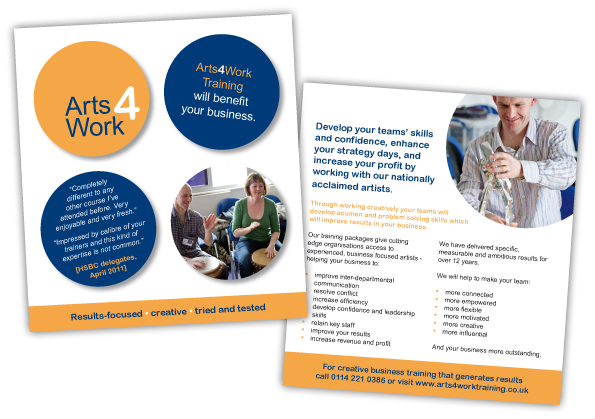 A double sided, custom size (148mm x 162mm) postcard for Arts4Work, part of Eventus, to promote their training courses.